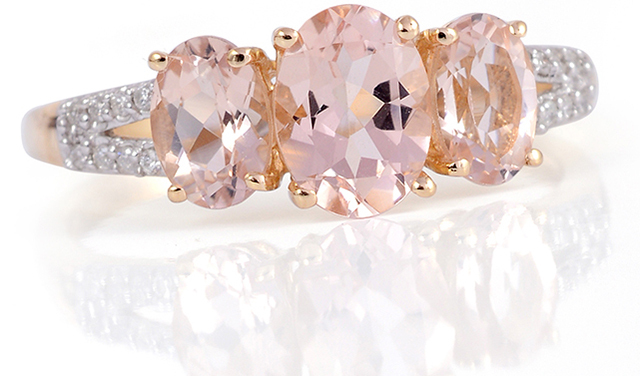 The most well known and coveted of the beryls, morganite is known for its dreamy pink hues. The renowned New York gemstone buyer George Kunz named morganite after his most affluent customer, the banking tycoon and gem enthusiast, John Pierpont Morgan. The first morganite to be described was in 1911, after it was found in California in a deposit rich in kunzite and other gemstones. Before this point it was known simply as a pink beryl. Morganite gems can be found in lots of pink hues, ranging from soft pink through to violet. They can also be found with an orange tint. Morganite is from the beryl family. Pure beryl is colourless, but morganite gets its pretty pink colour from manganese being present within its structure. It measures 7.5 to 8 on the Mohs scale, meaning it’s great for jewellery as it’s hardwearing. Today, gemstone healers use morganite for stress-related problems, as it’s meant to have calming and relaxing properties.